^ 1.0 1.1 Norman, Philip. Shout! : The Beatles in Their Generation. Fireside Books. 2005: 62. ISBN 978-0-7432-3565-5. ^ 2.0 2.1 Kane, Larry. Lennon Revealed. Running Press. 2007: 52. ISBN 978-0-7624-2966-0. ^ 3.0 3.1 3.2 Sutcliffe, Pauline; Tufnell, Guinevere; Cornish, Ursula. Working with the Dying and Bereaved: Systemic Approaches to Therapeutic Work. Routledge. 1998. ISBN 978-0-415-91993-7. ^ McGinty, Stephen. Stephen McGinty: Scotland meant a lot more to the Beatles than just Mull of Kintyre. The Scotsman (Edinburgh). 2011-08-12 [2015-05-05]. ^ 5.0 5.1 5.2 5.3 5.4 About Stuart. Stuart Sutcliffe Estate. [2015-05-05]. （原始內容存檔於2015年5月4日）. ^ Pawlowski, Gareth L. How They Became the Beatles. Penguin Books. 1989: 88. ISBN 978-0-525-24823-1. ^ 7.00 7.01 7.02 7.03 7.04 7.05 7.06 7.07 7.08 7.09 7.10 7.11 7.12 7.13 7.14 7.15 7.16 7.17 7.18 7.19 7.20 7.21 Spitz, Bob. The Beatles – The Biography. Little, Brown and Company. 2005. ISBN 978-0-316-80352-6. ^ Painting by Stuart Sutcliffe in his flat. National Museums Liverpool. [2015-05-07]. ^ 9.00 9.01 9.02 9.03 9.04 9.05 9.06 9.07 9.08 9.09 9.10 Miles, Barry. Many Years From Now. Vintage-Random House. 1997. ISBN 978-0-7493-8658-0. ^ 10.0 10.1 10.2 10.3 10.4 10.5 10.6 10.7 Lennon, Cynthia. John. Hodder & Stoughton. 2005. ISBN 978-0-340-89512-2. ^ "The Beatles Anthology" Episode 1 (Documentary TV series (DVD)). 事件發生在 0:27:24. 2003. ^ Norman Allanson. "I heard that Stuart had painted his room". Mersey Beat. [2015-05-07]. ^ 13.0 13.1 "The Beatles Anthology" Episode 1 (Documentary TV series (DVD)). 事件發生在 0:28:02. 2003. ^ Sutcliffe's President Bass. Rockmine.com. [2015-05-07]. ^ Photo of Sutcliffe in Church Choir. National Museums Liverpool. [2015-03-19]. ^ Coleman, Ray. Lennon: The Definitive Biography. Pan Books. 1995. ISBN 978-0-330-34568-2. ^ 17.0 17.1 Ryan, David Stuart. John Lennon's Secret: A Biography. Kozmik Press. 1982. ISBN 978-0-905116-08-2. ^ An Evening With Pete Best, Part I: The Interview. rickresource.com. [2015-03-19]. ^ Cole, Steve (director). 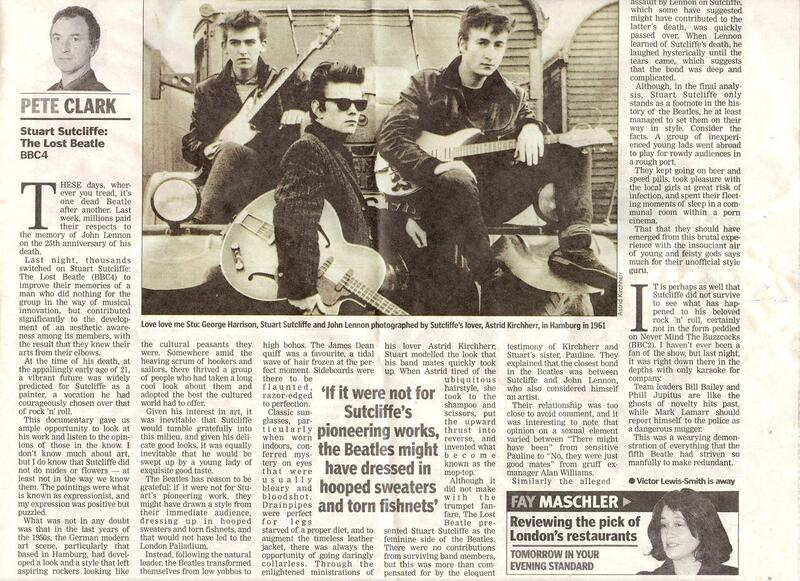 "Stuart Sutcliffe, The Lost Beatle" (TV Documentory). 2005. ^ Unterberger, Richie. The Unreleased Beatles. Backbeat (UK). 2006: 7. ISBN 9780879308926. ^ 22.0 22.1 The BeatlesTimeline. Beatles.ncf.ca. [2015-03-19]. ^ 23.0 23.1 Stuart Sutcliffe is interviewed for a teaching diploma at Liverpool College of Art. Beatlesbible.com. [2015-05-07]. ^ Hutchinson, Lydia. The Sgt. Pepper’s Album Cover: Faces in the Crowd. Performingsongwriter.com. 2014-03-29 [2015-05-07]. ^ 25.0 25.1 25.2 Beatles' Photographer Astrid Kirchherr Opens Up. NPR.org. 2010-10-19 [2015-05-07]. ^ Beatles Browser Four (p4). Bill Harry/Mersey Beat Ltd. [2015-05-07]. ^ Hamburg identity card, 1961. National Museums Liverpool. [2015-03-19]. ^ Eduardo Paolozzi's Report. National Museums Liverpool. [2015-03-19]. ^ Examples of Middle Work. Stuart Sutcliffe Estate. [2015-05-07]. （原始內容存檔於2015年5月4日）. ^ 'Hamburg Painting No. 2' 1961. National Museums Liverpool. [2015-03-19]. （原始內容存檔於2012-11-20）. ^ Sutcliffe's self-portrait (in charcoal). National Museums Liverpool. [2015-03-19]. ^ "The Crucifixion" by Sutcliffe. National Museums Liverpool. [2015-03-19]. ^ Letter from Sefton General Hospital, 8 September 1961. National Museums Liverpool. [2015-05-07]. ^ Ingham, Chris. The Rough Guide to the Beatles. Rough Guide, Ltd. ISBN 184836525X. ^ Giuliano, Vrnda; Giuliano, Brenda; Devi. The Lost Lennon Interviews. Adams Media Corporation. 1996: 3. ISBN 9781558506381. ^ Letter from Astrid to Millie, May 1962. National Museums Liverpool. [2015-05-17]. ^ In His Life: The John Lennon Story (2000). Rotten tomatoes. [2015-05-07]. ^ Walker, John. (1990). "Stuart Sutcliffe and the film Midnight angel". AND: Journal of Art / artdesigncafe. Retrieved 9 January 2011. ^ Clark, Pete. Stuart Sutcliffe, The Lost Beatle. Evening Standard. [1 July 2011]. （原始內容存檔於2011年7月16日）. ^ Clayson & Sutcliffe 1994. ^ Sutcliffe & Williams 1996. ^ Clough & Fallows 2008. ^ Fitch, Alex. The Resonance FM podcast: Baby's In Black. Self Made Hero. 10 May 2011 [1 July 2011]. ^ Artifacts/Memorabilia: Lyrics and chords for a Lennon/Sutcliffe song. Stuart Sutcliffe Estate. [1 July 2011]. （原始內容存檔於2011年7月4日）. Clayson, Alan; Sutcliffe, Pauline. Backbeat: Stuart Sutcliffe – The Lost Beatle. Pan Books. 1994. ISBN 978-0-330-33580-5. Clough, Matthew H.; Fallows, Colin. Stuart Sutcliffe: A Retrospective. Liverpool University Press. 2008. ISBN 978-1-84631-176-5. Coleman, Ray. Lennon: The Definitive Biography. Pan Books. 1995. ISBN 978-0-330-34568-2. Giuliano, Geoffrey & Giuliano, Brenda. The Lost Lennon Interviews. Adams Media Corporation. 1996. ISBN 978-1-55850-638-1. Kane, Larry. Lennon Revealed. Running Press. 2007. ISBN 978-0-7624-2966-0. Lennon, Cynthia. A Twist of Lennon. Avon Books. 1980. ISBN 978-0-380-45450-1. Lennon, Cynthia. John. Hodder & Stoughton. 2005. ISBN 978-0-340-89512-2. Miles, Barry. Many Years From Now. Vintage-Random House. 1997. ISBN 978-0-7493-8658-0. Norman, Philip. John Lennon: The Life. Ecco Press. 2008. ISBN 978-0-06-075402-0. Norman, Philip. Shout! : The Beatles in Their Generation. Fireside Books. 2005. ISBN 978-0-7432-3565-5. Pawlowski, Gareth L. How They Became the Beatles. Penguin Books. 1989. ISBN 978-0-525-24823-1. Ryan, David Stuart. John Lennon's Secret: A Biography. Kozmik Press. 1982. ISBN 978-0-905116-08-2. Spitz, Bob. The Beatles – The Biography. Little, Brown and Company. 2005. ISBN 978-0-316-80352-6. Sutcliffe, Pauline; Williams, Kay. Stuart: Life and Art of Stuart Sutcliffe. Genesis Publications. 1996. ISBN 978-0-904351-52-1. Sutcliffe, Pauline; Tufnell, Guinevere; Cornish, Ursula. Working with the dying and bereaved: systemic approaches to therapeutic work. Routledge. 1998. ISBN 978-0-415-91993-7. Sutcliffe, Pauline & Thomas, Douglas. The Beatles' Shadow: Stuart Sutcliffe & His Lonely Hearts Club. Sidgwick & Jackson. 2001. ISBN 978-0-283-07342-7. The Beatles. The Beatles Anthology (DVD). Apple records. 2003. ASIN: B00008GKEG. Unterberger, Richie. The Unreleased Beatles. Backbeat (UK). 2006. ISBN 978-0-87930-892-6. Woog, Adam. The Beatles. San Diego: Lucent Books. 1998. Martin, Marvin. The Beatles. New York: Grolier Publishing. 1996. Venzia, Mike. The Beatles. Danbury: Children's Press. 1997. Burlingame, Jeff. John Lennon "Imagine". Berkeley Heights: Enslow Publishers. 2011. Conord, Bruce. John Lennon. New York: Chelsea House Publishers. 1994.